• There are well-established pharmacologic and non-pharmacologic treatments for attention-deficit hyperactivity disorder (ADHD),1-4 but limitations to these treatments likely contribute to poor adherence over time. There is an ongoing need for novel approaches to ADHD treatment. • We present primary efficacy and safety results of the randomized Software Treatment for Actively Reducing Severity of ADHD (STARS-ADHD) trial of AKL-T01 versus an active control in pediatric patients with ADHD. • AKL-T01 is an investigational therapeutic digital intervention in development for the treatment of attention and inhibitory control deficits in pediatric ADHD. VeraSci presented results of a recent study utilizing is a brief tablet-based assessment of the paper-and-pencil based Brief Assessment of Cognition (BACS) assessing multiple cognitive domains, including verbal memory, working memory, motor function, verbal fluency, processing speed and executive function. We presented results examining criterion validity for the assessment of cognition in individuals with subjective cognitive decline by assessing the diagnostic sensitivity, specificity and test-retest reliability of the BAC App endpoints. Psychometric analysis showed intra-class correlations (ICC) for the BAC App composite were strong, ICC>.80 for Young Adults, Older Adults, and individuals with Subjective Cognitive Decline (SCD). Each test had one measure that produced an ICC of 0.74 or greater for the SCD group. The lowest ICC was observed for the Tower of London for the Young Adult and Older Adult groups and the Token Motor for the Subjective Cognitive Decline group. When a cut-off point of 1.5 SD was used, individuals without SCD were accurately identified 86.89% of the time (specificity), with a 90% chance that this identification is accurate (NPV).Findings suggest that the BAC App has good test-retest reliability; individual subtests demonstrate higher test-retest for individuals classified with SCD. The BAC App has good discriminative validity in terms of specificity and predictive value for categorizing SCD. 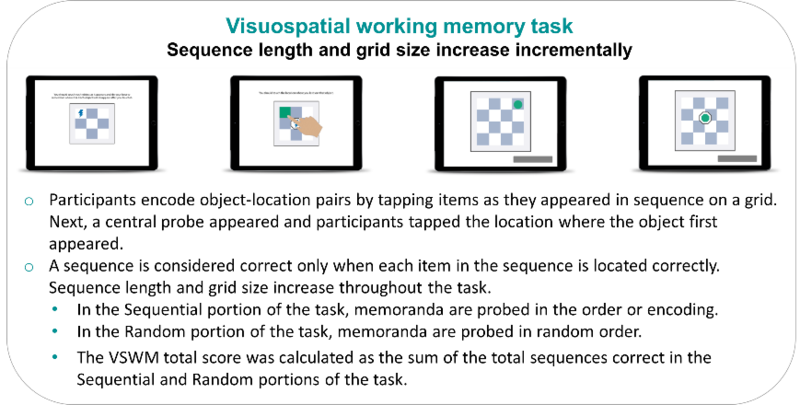 VeraSci presented results of a recent study utilizing a novel tablet-based visuospatial working memory (VSWM) task to examine differences between healthy older adults with and without subjective cognitive decline (SCD). Our VSWM task, developed in collaboration with AD opinion leader John Harrison, assesses the ability to encode and maintain the identity and location of increasingly complex sequences of visual stimuli.